Ngari Rinpoche Tenzin Choegyal, (b.1946). He is about two years old, has a shaven head and is wearing a robe of light-coloured silk and felt boots. 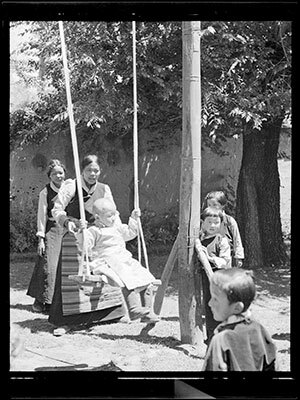 He is being pushed on a swing by a woman in a striped apron in the garden of Dekyi Lingka. There are girls and a nobleman (with his back to the camera) looking on. Manual Catalogues - Notes on negative index - Folio 57. '?Gyayum'. The Tibet Album. "Ngari Rinpoche on a swing in the Dekyi Lingka garden" 05 Dec. 2006. The Pitt Rivers Museum. <http://tibet.prm.ox.ac.uk/photo_2001.59.7.57.1.html>.